Desperate times call for desperate measures, and sometimes the lengths a superhero is willing to go to in order to protect humanity from disaster just won’t suffice. Enter the antihero: flawed, socially outcast and ruthless, but wholeheartedly committed to the task in hand. Think Gotham’s brooding ‘Dark Knight’, Daniel Craig’s paradigm-shifting portrayal of James Bond and, more recently, the vexed and vengeful Deadpool. The popularity of such characters has soared in recent years. While fiction’s most compassionate hero Superman embodies society’s highest virtues and morals, he lacks the more human character traits of you and I. Nobody is perfect. We can endeavour to go through life as honourably as possible, but we’re all capable of negative emotions like anger, fear and jealousy; what sets us apart from each other is how we choose to deal with them. The virtuous hero who can do no wrong is an outdated projection of society’s need to conform, whereas the antihero is someone we can all identify with. In just six weeks time, DC Comics will be welcoming some new faces into its famed Cinematic Universe – an unlikely lineup of delinquents hailing from fictional prison Belle Reve Penitentiary. 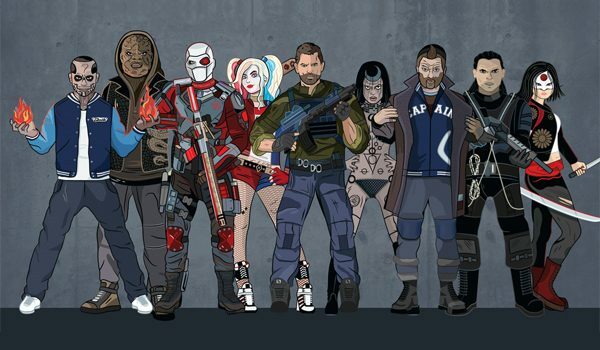 Collectively known as the Suicide Squad, they have been recruited into a kind of work release program by a secret government agency to undertake high-risk, black ops missions under the pseudonym ‘Task Force X’ in exchange for reduced prison sentences. These guys and girls have a plethora of deadly skills between them, and are a force to be reckoned with. But as mere mortals, they are expendable, and if they should stray from their assignments, they can wave goodbye to their incentives. In anticipation of the Suicide Squad’s cinema debut on 5th August 2016, the team at www.casinoreviews.co.uk has produced this fantastic infographic to take a closer look at the team members, their backgrounds and their many skills.